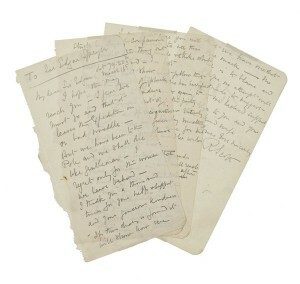 The first of the farewell letters written in the Antarctic by Captain Robert Scott as he realised that he and his team would not survive is for sale at Bonhams Polar Sale in London on 30 March 2012. The letter was at one time owned by the famous American polar explorer, Rear Admiral Richard E Byrd, and was presented to him at a dinner in his honour in 1935 by Sir Edgar Speyer’s widow. The recipient of the letter, Edgar Speyer, was a well known business, political and philanthropic figure before the First World War. He had played a major role in raising funds for Scott’s expedition and Mount Speyer in the Arctic was named in his honour by Scott. American born to a wealthy German family, Speyer became a British national at the age of 30 in 1892. A great patron of the arts, particularly music, he personally funded the Proms for many years and single-handedly secured their long tem future. Richard Strauss dedicated his opera Salome to him. Scott need not have worried about the future of the team’s widows and orphans. Once the contents of his final letters became known, there was a huge outpouring of public sympathy resulting in enough money not only to pay off the expedition’s debts but also to settle annuities on the families of those who died and to endow the Scott Polar Research Institute.